A one page HTML theme for freelancers. Freelancer Theme is a one page freelancer portfolio based on the original Bootstrap theme by David Miller and on Jerome Lachaud’s Jekyll theme. 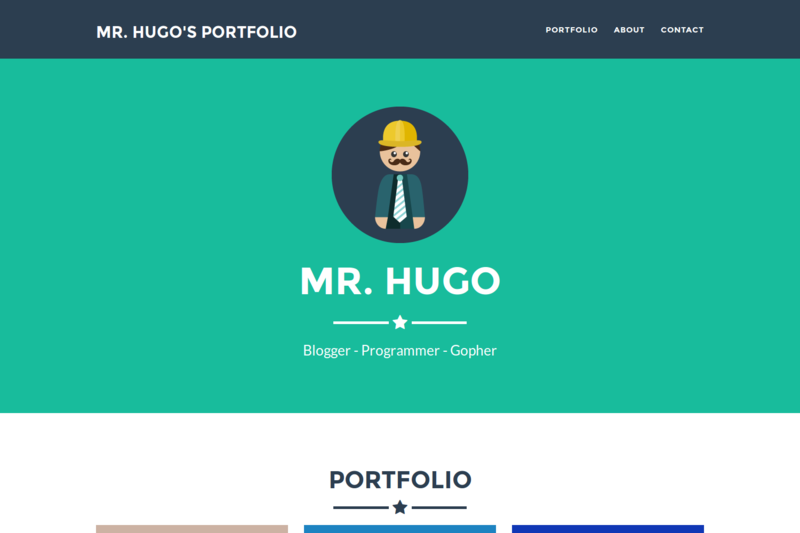 This Hugo theme features several content sections, a responsive portfolio grid with hover effects, full page portfolio item modals and a contact form. After installing the Freelancer Theme successfully it requires a just a few more steps to get your site running. Take a look inside the exampleSite folder of this theme. You’ll find a file called config.toml. It contains detailed information about the setup of the contact form (or see below) and the customization of all strings in this theme. To use it, copy the config.toml in the root folder of your Hugo site. Feel free to change strings as you like. The variable ‘icon’ represents the shown icon of the social network. It’s a CSS class of Fontawesome’s popular icon font. Search here if you need a particular icon. description: Use this area of the page to describe your project. The icon above is part of a free icon set by [Flat Icons](//sellfy.com/p/8Q9P/jV3VZ/"). On their website, you can download their free set with 16 icons, or you can purchase the entire set with 146 icons for only $12! Copy the folder projects inside the data folder in the root directory of your site. Let’s make some changes to show your work. Pay attention to the modalID. It must be a unique integer and be incremented with each new project you want to add to the portfolio. Otherwise, the corresponding modal can’t be rendered. Furthermore, you can use Markdown syntax for URLs like here [text](//url.to/source) in the description. Copy the image of an project inside static/img/portfolio and just enter the filename. This theme is released under the Apache License 2.0 For more information read the License.